58’ - Ivanschitz has been dropping dimes on his crosses tonight. Dude is pinpoint. 59’ - Evans has been a nice boon to the attack at LB, his 347th position this season. Pretty sure he’ll put in a stint at crossbar next. 60' Giovani dos Santos takes a shot from wayyyy out despite having Gerrard and Keane in very good positions. He had to do better there. 63’ - Game has slowed down (finally). Rain inflicting some damage on the speed of build-up. Still expect more shots. 66’ - CHANCE IVANSCHITZ. Andreas latches onto a through ball from Oba that immediately won a Pulitzer, but he fires at Ricketts’ feet. 66' Ivanschitz strips a midfielder and then hustles back to force Ricketts to make a save. Better from the Sounders in the last few minutes. 67’ - The middle of the field looks like the nerviest game of Hot Potato in world history right now. 68’ - CORNER SOUNDERS goes short, players do a bit of croquet and it’s cleared out. Then Gerrard high kicks a clear. WHAT. 69' 2-2. OH MY GOD STEVEN GERRARD. 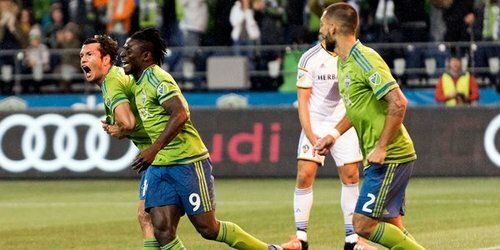 Gerrard with the clearance after Obafemi Martins just misses a chance. Seattle piling on the pressure. 70’ - Gerrard went full Rockettes kick line on that clear. 71’ - Galaxy have looked entirely out of sorts over the past 7-10 minutes. Seattle without the goal to make it count, though. Donovan Ricketts seems to get blocked after slipping and the Swede puts Seattle ahead with a great finish. 74’ - What. A. Hit. Son. 74' 3-2. Can the #LAGalaxy come back for a third time? They've been unable to generate much offense at all this half. 75’ - Chad Barrett time, in for Valdez. Six goals for him tonight or seven? 75' Seattle substitution: Chad Barrett checks in for Nelson Valdez. 76’ - Lest we all need reminding, the defending champs can score. Fast. Game. Not. Ovah.